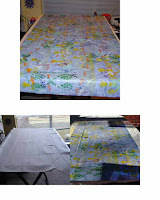 Last summer, when I first started playing with the layered paint style I made a set of 4 placemats. These quickly became my favorite placemats. The 2 things I like the best are .. 1) they are colorful and different and 2) they wash off with a cloth ... no washing, drying, folding, etc. Think I'll make some more. This creation is a set of 6 placemats. I'm going to complete the painting on one piece of canvas and then cut it down into seperates. Cut a piece of artist canvas at 28" x 54". Applied one layer of dark blue paint; set aside to dry. Mixed a nice light blue with glaze and painted on. Added a line design with a paint comb; set aside to dry. Took outside and applied a variety of stencils with spray paint in maroon, yellow, green and white. Allowed to dry. Brought back in and appliedwriting/scribbles with permenant markers and stencils and texture with acrylic paints. I think there's enough design on here, but I'm going to let it sit overnight and will re-evauluate in the morning.